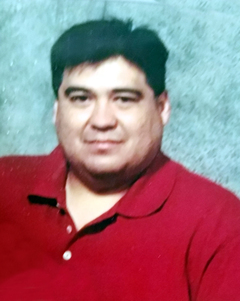 Prayer services for Joe Isaac Torres Jr 57 of Lubbock will be Monday, September 10,2018 at 7 PM at The Broadway Funeral Chapel. Funeral services will be on Tuesday, September 11, 2018 at 10 AM at The Chapel in Broadway Funeral Directors with Rev. Dan Davila officiating. Burial will follow at The City of Lubbock Cemetery under the direction of Broadway Funeral Directors. Joe was called to be with the Lord on Saturday, September 8, 2018. He was born on July 27, 1961 in Lubbock to the late Joe C. Sr and Margaret Torres. He married Lisa Salazar on June 24, 2000 in Lubbock. He enjoyed all kinds of sports, especially playing golf. He had managed and worked for Kmart for over 38 years. He loved to spend time his nieces and nephews. He is preceded in death by a sister Yolanda Martinez. Survivors include his wife Lisa of Lubbock, a sister Rosemary (Nick) Mendez of Lubbock, three brothers Tony (Elisa) Torres, Rudy (Annette) Torres, Bobby Torres all of Lubbock, and a host of nieces and nephews.